Averaging 18.4 ppg (.452 FG%, .344 3pt%, .793 FT%), 5.9 rpg, 2.3 apg, 1.3 spg and 35.7 mpg in 723 career games (started 685) in 10 seasons with three teams: Memphis (2006-07 – 2012-13), Toronto (2012-13 – 2013-14) and Sacramento (2013-14 – 2015-16) ... 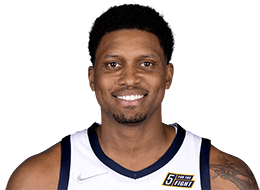 All-time Grizzlies franchise leader in steals (640) ... One of four NBA players to compile at least 6,000 points, 2,000 rebounds, 500 steals and 250 blocks over the last five seasons (LeBron James, Kevin Durant and Josh Smith) ... Holds career postseason averages of 19.0 points, 6.6 rebounds and 1.4 assists on .421 shooting in seven playoff games.